characters bellowed out, in a thick British accent, "Great Scott!" I began to wonder exactly which Scott they might be referring to. 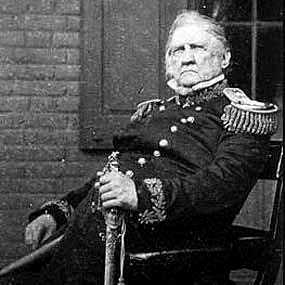 U.S. general, Gen. Winfield Scott, a hero of the Mexican War. Yep, it's this one they're all shouting about! Which begs the question, "How in the world do you know this?" This makes one wonder what happened to the human form when somebody so paunchy has him and a face only a mother could recognize turns into a General Eisenhower who wins WWII in Europe with help from the Allies, of course. Willow: That was some interesting information on the term. "It was movie night at The Manor..."
Great Scott!!! Methinks it is movie night at The Manor every night! This is great! I had no clue where that expression came from and I'm still laughing over Abraham Lincoln's comments...LOL!! Abe, yeah, you can't always judge a book by it's cover, right? I think in my mind's eye, I'd prefer to be thinking of the Liam Neeson version! LOL! I'd forgotten about that movie--that's interesting about this expression. Who knew! 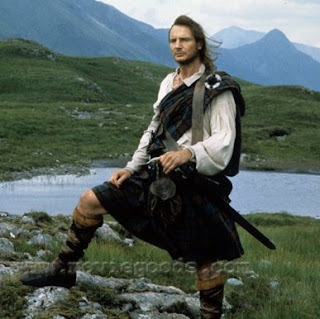 I'll take Liam Neeson as Rob Roy any day! You are quite the blogger maverick Willow. How in the Sam Hill did you think to post on this? I love etymology! I'll add this tidbit to my Trivial Pursuit list! Stevie, I love etymology, too! This is going to be one of my regular features. I am forever looking up the origins of words and phrases...I might as well pass them along to my peeps. I can remember someone's grandparents saying "Great Scott!" and "Caesar's ghost!". Interesting to know where it comes from. Be still my heart! I open your blog and that gorgeous hunk of a man appears! Blush blush...what is it about a man in a kilt that makes my heart go pitter patter so strongly? There must be some genetic pull! Thanks so much for entering my blog give away and your kind comments. I have been off line quite a bit the past two days because of bad thunderstorms passing through in our area so I'm late on my own comments...sorry! Oh yes...in all my gushing over Liam Neeson I forgot to add that I love etymology also! This was very interesting. Thanks! funny but i would have placed that saying in england or scotland in a much earlier century. i like it when you give us these little bits of info. fun, fun, fun! I learned something new today! By the way, I liked the movie "Rob Roy". Thanks. Thanks for the history lesson. I never would have though it referred to Old Fuss and Feathers! Thanks for the visit today. It's always nice to meet a fellow Mrs. Dalloway devotee. And I adore the photo of your front entrance! Magical. Come again soon! "Bob's your Uncle" - one of my all time faves and I featured as my BWOTD a few months back. Basically it means "and there it is"! Us Brit's have lots of funny things we say and many of them have their origins in the days of the British Empire or historical references. When I hear "Great Scott! ", I always think of Doc in Back To The Future. Nice to know the origin now though. I actually knew that as someone had asked me that. Isn't that funny. It's rather like the shock I got when or dear little Teddy Bears were actually named after An American, Teddy Roosevelt as you know. Fascinating! Now can you tell us who Gordon Bennett was? The name was used as an exclamation until quite recently in the UK.